The Persian Building was located on the south side of the Pacific Southwest Exposition's Avenue of Nations, adjacent to the Latin-American Building. 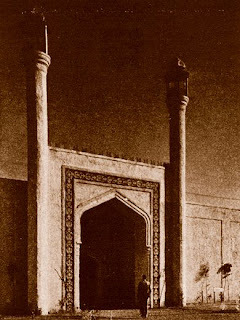 The entrance to the traditionally designed structure was through an arched Persian-style portal, flanked by two slender minarets. Persian diplomat, Dr. Ali-Kuli Kahn, served as the building's host; and the exhibits contained within were all from his personal collection. Dr. Kahn also presented daily lectures regarding the various objects displayed in the building, as well as many educational and historical discourses about Persia. The numerous displays consisted of rare books, manuscripts, rugs, silks, tapestries, furnishings, miniatures, tiles, metalwork, and jewelry. The entire collection of Persian treasures was valued at over $1,000,000; although many of the objects were actually priceless, due to their rarity.